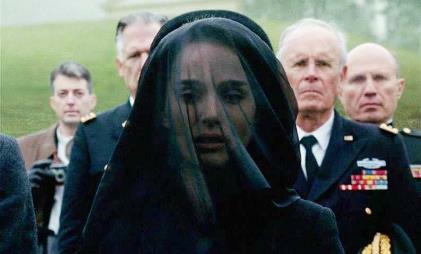 “Jackie” (2016) is a Kubrickesque film with Natalie Portman as Jackie Kennedy in the moments and days just after her husband, US President John (or Jack) Kennedy, was shot dead. Set in Dallas and DC, it was filmed in Paris. About a North American woman, it was directed by a South American man (Pablo Larraín of Chile, in his first English-language film). As told to Life magazine: Those terrible days are shown through flashbacks a week later as she tells the story – well, a story – to Theodore H. White (Billy Crudup), a reporter from Life magazine. We see what she went through, from the moment her husband was shot to the moment she was made to leave the White House not long after the funeral. The most graphic flashbacks are left for the end. As told to her priest: We also see her talking to Father Richard McSorley (John Hurt) on long walks where her account is more honest and complete, where she is trying to make sense of it all. Brave front: She tells Bobby Kennedy (Peter Sarsgaard) that they must be with Jack on his last march and march behind his coffin and the riderless horse (modelled on Lincoln’s funeral march). Bobby says there are too many roofs and too many windows for shooters to hide behind between St Matthew’s and Arlington Cemetery. She puts on a brave front for the nation – but tells her priest that she wanted to die. Cruel fate: Her son Patrick, she tells her priest, was on this earth for only 39 hours – just long enough for her to fall in love with him – and then God took him away. Over and over, God makes her dreams come true and then smashes them to bits right in front of her. Why? Jackie in Camelot before it was Camelot. Myth: While talking to Life magazine we see her right before our eyes christen the Kennedy White House “Camelot”, after Jack’s favourite musical. The film shows her behind the scenes carefully creating the Kennedy image. But the image was not mere vanity: both she and the nation needed a fairy tale to believe in. The naked truth itself was too hard to bear. 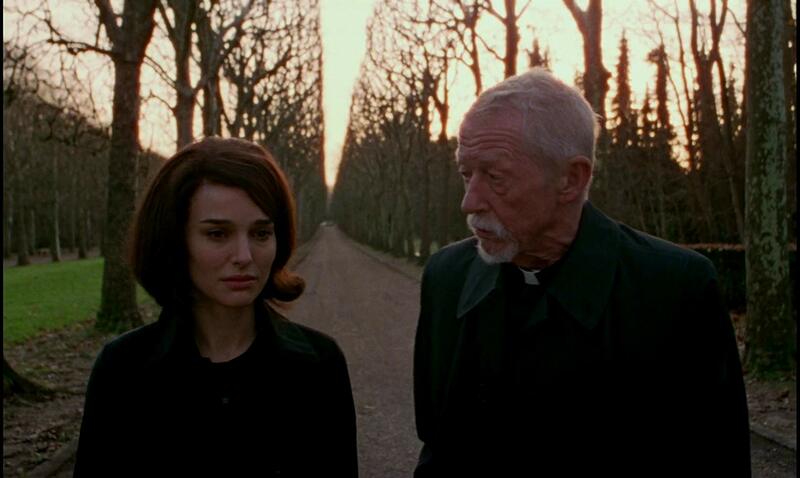 Jackie and Father McSorley (John Hurt). God: She talks to John Hurt on those long walks hoping he would give her the answers at the end of the book. He tells her there are no answers. God gives us just enough every day to keep us going. As he says that she remembers playing with her two living children at the edge of the sea. Truth: The film takes pains to get the knowable facts right. 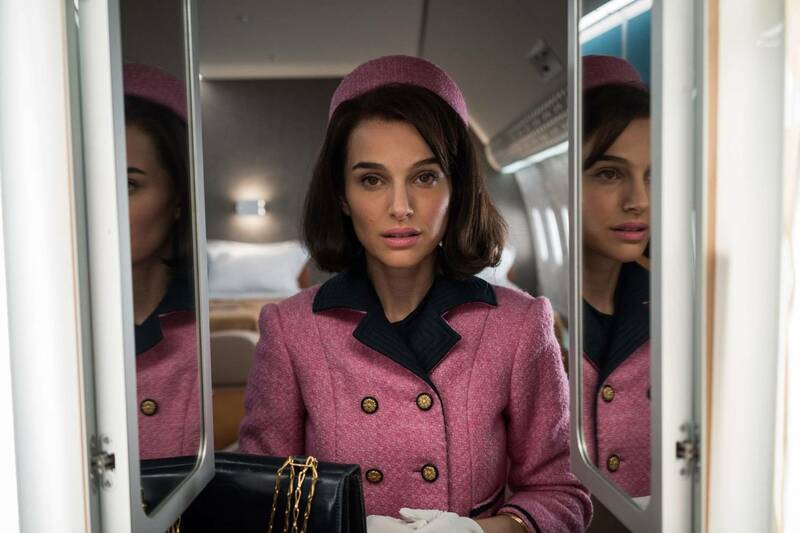 Portman’s accent sounds overdone, but that is just how Jacqueline Kennedy talked, at least on television. We have the YouTube clips. Father McSorley was made up, but he is based in part on letters she wrote to priests. In the end, though, she made sense of it all not through her Catholic faith, as the film would have it, but through Greek tragedy. I thought she did a good job capturing the essence of Jackie Kennedy. Damn. They made her leave the White House not long after the funeral. Geesh. It was Monday, December 2, and she and the children had returned from Cape Cod the night before in anticipation of moving out of the White House family quarters at the end of the week so that Lyndon and Lady Bird Johnson could move in. Jackie had initially hoped to be ready to go on Tuesday, but the move had had to be put off until Friday.